Dr. Pattni is a very professional and experienced optometrist. He was very thorough in his examination and addressed allthe concerns I had. I was seen almost right away after checking in early to my appointment. Dr. Pattni is a very professional and experienced optometrist. He was very thorough in his examination and addressed all the concerns I had. I was seen almost right away after checkingin early to my appointment. Top notch gentleman, a pleasure to see, the quickest and best eye exam I've had in many, many years. Dr Samir Pattni, O.D is a graduate of the Illinois College of Optometry in Chicago, Illinois. His externship was completed at Chicago Osteopathic Medical Center. To further his specialization, in 1992 he began his practice at the El Paso Institute of Eye Surgery, where he gained extensive experience in treating Ocular Disease and management of care for post retinal surgical patients. 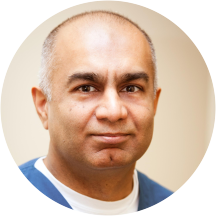 Dr. Pattni has been in private practice in Plano since 1996 specializing in Therapeutics, Contact Lenses, Low Vision and Refractive Surgery. He is an Optometric Glaucoma Specialist and prescribes medication for the treatment of Glaucoma as well as oral medication for the treatment of disease. Dr.Pattni volunteers his time in support of the Lions Club and Essilor Vision Foundation, providing complimentary vision screening services at inner city schools in the Dallas Metroplex. In recent years he has volunteered with Medical Wings International participating in medical missions to India, Honduras and Peru. The mission trips were taken with a volunteer team of Primary Care physicians, Dentists and Optometrists who coordinate their services to provide free eye and medical care to some of the poorest communities in these countries. Dr. Pattni is fluent in English, Spanish and Hindi. Very professional and helpful doctor. Dr. Pattni was amazing and the ladies at the reception desk were friendly and welcoming. I will definitely be back! Very good experience, no wait time, staff is courteous, and the doctor is really nice. Dr. Pattni has very pleasent manners and he was very thorough in the checkup. The staff was very helpful. Dr Patni was very helpful and patient. He listened to all my questions and gave right directions. He was very thorough in his communication and the check up done. I was very pleased with his professionalism. Dr.Pattni is very easy going and explained everything that needed to be done. Thank God for Dr's like him. I will definitely go back and also refer him. I appreciate the personal attention, and the office staff was very gracious even though I was late! Very professional. Always a great visit. Remembers his patients personally and takes time to talk. The best Dr God bless you all. Dr. Pattni and his staff are awesome! Great staff and they are wonderful to work with. Staff tech was not very friendly and matter of fact. Dr. Pattni is very professional and knowledgable. He took time to talk to patients and made those medical terms very easy to understand. Highly recommend him to anyone who is seeking a good eye doctor in Plano. He tells you everything you need to know, and he asks lots of questions to ensure you are getting the most accurate prescription possible! Friendly as well. Great service and excellent care. Everything was explained to me and he and the staff made everything easy to understand. I would highly recommend this practice to anyone who needed quality eye care. Knowledgeable and caring. All you can ask for. Highly recommend. All questions answered and very informative. It was a very good experience. I been a patient of Dr. Pattni's for over 10 years, and I've never had a single issue. Dr. Pattni is very professional and also very friendly. I'm a lifer! Always professional and has your best interest at heart. He was thorough in his exam and explanations regarding advantages and disadvantages about continuing to use bifocal contacts and using prescription glasses. Listened to what my vision needs are on a day to day basis to tie that into a recommendation for securing the best vision possible. Dr Pattni was very polite and was very detailed when explaining what was being done. The office was clean and the staff very pleasant. I enjoyed him he explain everything to me. Nice & explained everything very well. Based on my recent visit, Dr. Pattni was very personable & knowledgeable. His staff was extremely courteous & professional. I was very impressed. He seemed to genuinely care and the ladies up front were great as well!! !